Craig Pawson will be the man in the middle for Brighton & Hove Albion's Premier League match at Wolves on Saturday. The Seagulls go into the game on the back of five successive defeats but will have fond memories of the last time Pawson was in charge of one of their matches. 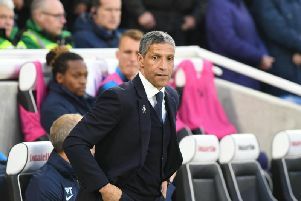 The Sheffield-based official has refereed just one Brighton game this season but that was the 2-1 victory at arch rivals Crystal Palace last month. Pawson has taken charge of three Wolves games this season, their opening-day 2-2 draw with Everton, 2-0 home defeat to Liverpool and 3-0 loss at Manchester City. He has shown 84 yellow cards and five reds in 24 Premier League games this season. The assistant referees on Saturday will be Lee Betts and Ian Hussin and the fourth official is Simon Hooper.